The Rev. Peter M. Donohue, OSA, PhD, ’75 LAS, held a reception in the Presidents’ Lounge, Connelly Center, on May 6 in recognition of Falvey Memorial Library’s receiving the ACRL Award for Excellence in Academic Libraries. Father Donohue had invited all Falvey staff members to the reception “to recognize your work in achieving the ACRL Award.” As you can see in the photos below, Library staff enjoyed food, beverages and fellowship. 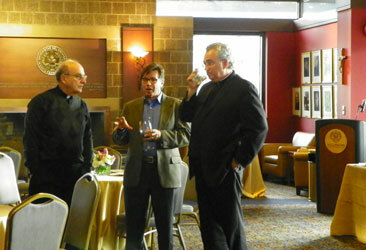 Father Kail Ellis, Joe Lucia and Father Peter Donohue. 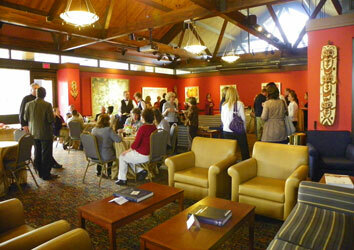 Falvey Library staff gathers in the Presidents’ Lounge for the reception. 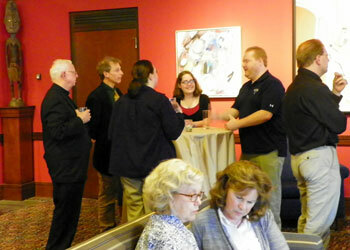 Falvey Library staff enjoy good food, drinks and good company.